When Japanese YouTuber LUNA ANGEL returned from the grocery store, she took one of the quail eggs from her bag and gave it to her pet budgie to play with. 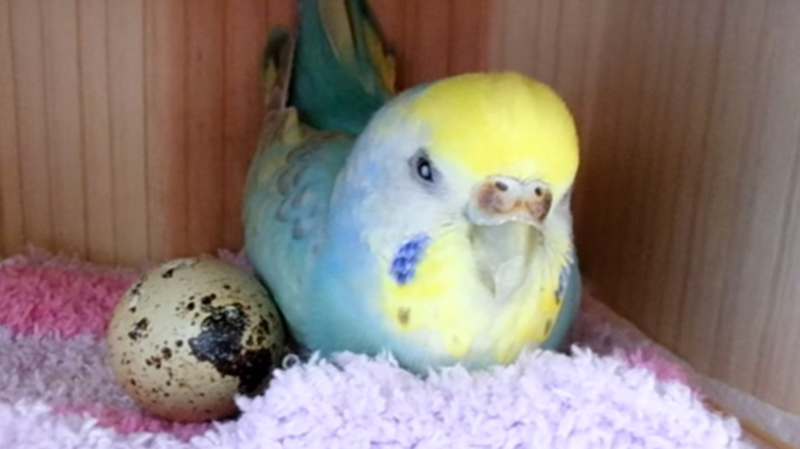 The bird (named Pi-Chan) took on the role of a surrogate mother and nested the egg. While the process was cute to watch, no one expected Pi-Chan's efforts to pay off. They did. Such a phenomenon would probably not happen in the United States—we refrigerate our eggs to keep them fresh—but in Japan, people tend not to store eggs in the fridge. Even so, eggs sold in grocery stores are (usually) unfertilized, so the odds of a chick actually emerging from one were extremely low. Luna has been taking care of the miracle quail and named it Yuzu, all while recording Yuzu's progress on YouTube. Click on over to her channel to watch the baby bird walk around, blink, and even yawn.